It sure has been a long time since I’ve last blogged. So much has changed and I don’t even know where to start! In short, I’ve done a career change from Psychiatry to freelance musician, I have also moved country, from Melbourne, Australia to Kuala Lumpur, Malaysia. Home country but alas not my hometown. Those would have been great materials to blog about but I have well and truly settled in my new home and thus those have become old news. Suffice to say though, making the changes weren’t easy and there has been definitely ups, and terrible downs. Many a times I have thought about coming back to blogging but thoughts have not materialized into actions until well, now. So why now? To give you an idea of what daily life is like for me: I have become nocturnal, yes, just like back in Uni days. Most of my activities are done in the evenings and well into the nights. Most days I stay at home, except when I have to head out for some form of rehearsals, or social activities (not much to speak of). Weekends are usually filled with gigs at various bars or pubs, and weekdays are my ‘slow days’. Which explains why I’d dedicate this blog to everything food related as I now have even more time to cook (and eat). Posting the pictures in facebook is just not the same. I was curious to see how a curry without milk or yoghurt would taste like (of course, you could also add coconut milk since it’s well, vegan but alas I did not have it in my pantry), and used lemon to bring out the flavours. And surprisingly it tastes really good! 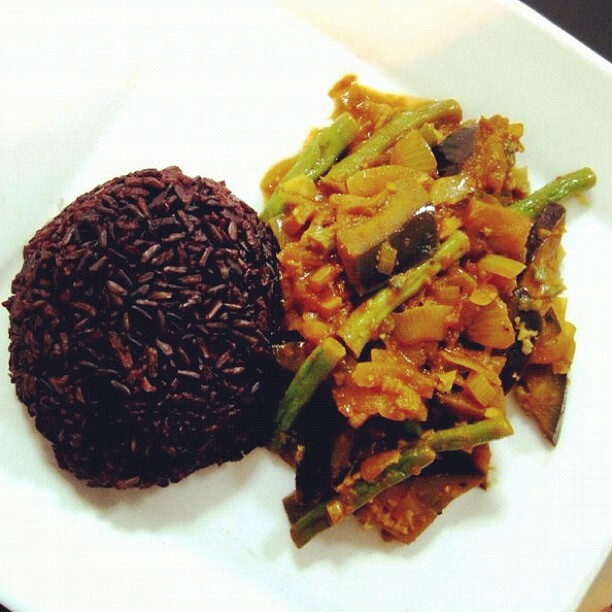 I’ve also paired it with black rice which has a nutty taste, and it goes well with the curry. The only veges left in my fridge were eggplants, green beans and tomatoes apart from the essentials so I’ve used these. And the recipe? It’s really simple. One Medium Eggplant, cut into 3cm small slices. 3 or 4 candlenut, crushed and chopped. Mix the spices into a paste with a bit of water and light soy sauce. In a deep saucepan first fry the onion in oil, then add garlic and ginger. Cook til soft. Add the spice paste, then the candlenut, fry til fragrant. Add the tomato, then eggplant, cook for about 10mins, and add the green beans. Cook for another 10-15 or until eggplant slices are soft enough. Add a generous squeeze of lemon after you turn off the heat. Then serve with rice or bread. Other veges you can use, are okras, pumpkins, cauliflowers, spinach, etc etc… just use your imagination! So if you’d like to start off your week with something light and healthy, try this, you won’t regret it! Will be posting more vegan recipes through the week! Look forward to being your Crash Test Dummy etc. Official Guinea Pig On Duty, waiting for orders. ..